View more collections from the Foscue Map Library. There are 41 aerial views in this collection, representing photographs taken by Lloyd Long in the 1930s and 1940s. The photographs include various images of Dallas, Mountain Creek Lake, White Rock Lake, and the Trinity River, including two aerial surveys (multiple photographs that fit together to make one overall image) of White Rock Lake and the White Rock Creek area. The collection demonstrates Long's interest in civil engineering and industrial subject matter, exemplified in the images of the Trinity River levee system, the KRLD and WBAP radio transmitters, the Carrollton Dam, and the Mountain Creek General Station. Of note are the images of the flooding of the Trinity River in 1935 and in 1941. In fact, some of Long's photographs were used in documenting the new levees' effectiveness in an article published by the Dallas Morning News in May 1935. 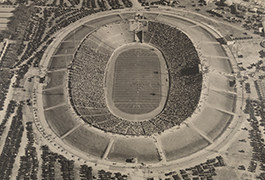 Most of the photographs are taken at an oblique angle and at a closer range than the aerial photographs in the Dallas Historic Aerial Photographs and the Dallas Aerial Photographs, 1945 USDA Survey collections. These photographs are housed in the Edwin J. Foscue Map Library. The library worked with regional historian George Cearley to identify important features in the photographs such as major roads, railways, and landmarks. A transparent overlay with locational markers was created for each photograph to label these features. In the digital collection, there are two versions of each image, labeled and unlabeled. Labeled images replicate the physical overlays created for the originals and correspond to a legend that appears in the Labeled Features metadata field below the image. 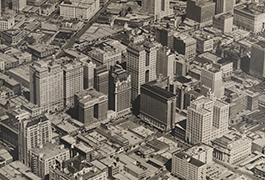 The Miscellaneous Aerial Views of Dallas, 1930s-1940s complements the Dallas Historic Aerial Photographs, 1930 Fairchild Survey and the Dallas Aerial Photographs, 1945 USDA Survey. 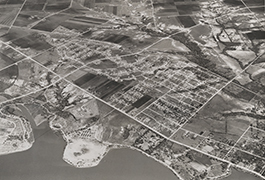 A related digital collection, White Rock Lake Aerial Photographs, 1927 Fairchild Survey, is available from the DeGolyer Library. Described in the Dallas Morning News as "a pioneer in the field of aerial photography," Lloyd Long was a prominent citizen and an important part of Dallas' aviation history. Born in 1896 in Spokane, Washington, Long finished a graduate degree in business at MIT in 1917 and thereafter became a senior instructor in aerial photography at the U.S. Naval School at MIT. 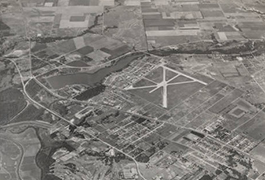 After World War I ended, Long moved to Dallas in 1920 to join Fairchild Aerial Survey, Inc. While working there, he helped to develop the Fairchild camera, which featured a shutter placed between the lenses to allow for better aerial pictures. This camera system became standard on aerial cameras for the next 50 years. Long also founded his own company, Long Aerial Photographic Service on North Akard, specializing in aerial and industrial photography. This collection's images were taken as part of his work in this business. 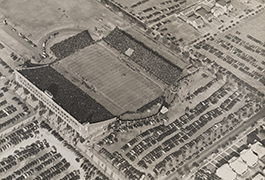 Several of his aerial photographs were printed at various times in the Dallas Morning News. He was a vocal advocate for the Ulrickson Plan in 1927 that went on to overhaul the Trinity River levees as well as the water and sewer systems, and his interest in Dallas' development can be seen throughout the collection. He was the chairman of the Dallas Flying Club and was a director for the Aviation Cadets of America in the years leading up to the second World War. He performed secret work for the FBI during World War II. Long lived and worked in Dallas until he died in 1956. There are two types of aerial photographs: vertical and oblique. Vertical images are taken from a vantage point directly above the subject or with a slight tilt. 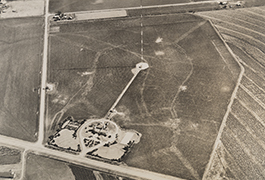 This type of photography is often used for the purpose of surveying or mapping land, as evidenced by the Dallas Aerial Photographs, 1945 USDA Survey collection. Oblique aerial photography is taken at a distinct angle. One of the benefits of oblique photography is that it allows for better recognition of buildings and geographical features. The images in this collection exemplify low oblique photography because there is no visible horizon. Some of the images are taken from a relatively low altitude, as well, which grants familiarity and intimacy with the subjects. This can be seen in the images of Ownby Stadium and of downtown Dallas at night.